AAA Freight has opened an advanced storage facility specially designed to store & distribute a wide range of industrial & commercial goods along with a dedicated inter-locked yard for open yard storage solutions extending supply-chain solutions to an array of industries, which includes Manufacturing, Industrial, Retail, FMCG, Healthcare, Oil & Gas & Automotive Logistics. The warehouse is designed to offer range of expert handling services complimented with the latest innovations in warehouse software management systems. 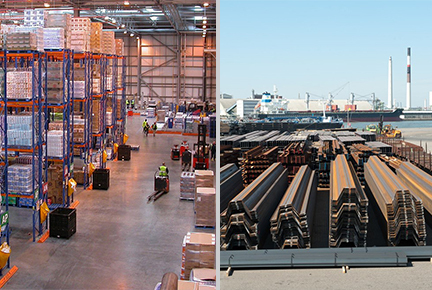 Handling large breakbulk shipments or specialized materials and project cargoes at the dedicated interlocked open-yard has been the key strength towards the Open Yard Storage Solutions provided by AAA Freight Services . AAA Freight is dedicated to ensuring that the service exceeds expectations, provides appropriate and careful product care, can provide added value services,accurate inventory control and the provision of comprehensive management information. AAA Freight extends flexible and customized solutions adapting to unique customer requirements. The warehouse facility provides secure storage, product care & inventory management., along with the WMS system, which are customized as per client requirement helping in providing flexible reporting to the respective clients. The highly efficient inhouse team provides pick & pack operations, order management, re-packing & re-labeling along with palletizing & Wrapping services, which helpscustomer to meet constantly changing market needs, at the same time optimize the supply chain and service level at the point of sale.